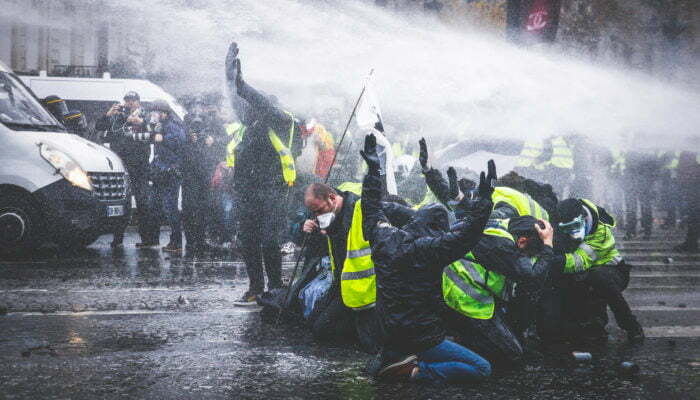 Although France’s Yellow Vest movement isn’t directly tied to Bitcoin, cryptocurrency, and blockchain technologies, the two revolutions (of sorts) have quickly joined hands. On January 6th, Pascal Boyart, a pro-crypto Parisian artist and muralist took to Twitter that he or she painted a puzzle, which depicted contemporary revolutionaries clad in Yellow Vests and a woman with the French colors in hand. Although the mural seemed innocuous enough, Pascal explained that he/she, along with pro-Bitcoin venture capitalist Alistair Milne, had hidden a secret private key in the art installment. The private key led to a wallet containing 0.26 BTC, valued at approximately $1,000 at the time of deposit. Now, just one week later, after crypto media touted the mural en-masse, Pascal took to Twitter again to claim that someone solved the puzzle, citing address data from Blockchain’s block explorer. And, just an hour later, Twitter users going by Antoine and Brito responded to Pascal, claiming that they were the ones that solved it. The two detectives walk away with 0.289 BTC, valued at $1,025 factoring in Sunday’s sudden market downturn. This little treasure hunt came amid cries that France’s Yellow Vest (Gilet Jaune) movement, focused on curbing an array of policies from Macron’s government, have begun a bank run. Per previous reports from NewsBTC, an activist going by Nicolle Maxime took to social media to rally individuals to withdraw money from centralized financial institutions. In a thirty-three minute video, the French national beckoned his fellow Gilet Jaunes to take more severe action. While Maxime’s thoughts were scattered, as he covered an array of topics in a rant-esque style, the key takeaway was that during “Act 9” (the ninth week of this movement), individuals participating should embark on a bank run. Maxime explained that this would turn the tide in the Yellow Vests’ favor. This comment was hinting at the commenter’s thought process that Bitcoin could garner adoption in the European powerhouse.And in Anthony Pompliano’s words, it seems as though the virus has already begun to spread. On Wednesday, Reuters reported that along with cigarettes, cigars, lottery tickets, and other corner store staples, visitors to Paris Tabacs will be able to purchase BTC for their Euros. This integration, first activated in six stores, is supported and backed by Keplerk, a fintech startup based in the nation. Adil Zakhar, one of the pro-crypto firm’s co-founders, claimed that by February, over 6,500 Tabacs will support purchases for the leading blockchain-based asset (via a voucher system). Zakhar explained that as many consumers find it “complicated to get BTC online,” an integration into trusted local tobacco shops is better than anonymous, often hard-to-use websites.